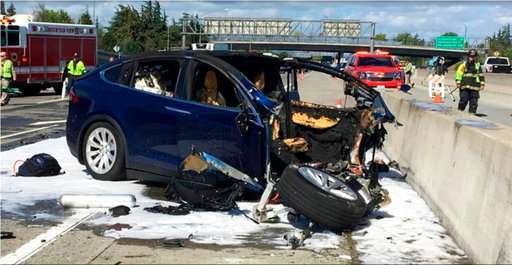 A Tesla SUV using the company's semi-autonomous Autopilot driving system accelerated just before crashing into a California freeway barrier, killing its driver, federal investigators have determined. Tesla wouldn't say if the system performed as designed. A spokeswoman referred to a company blog saying that a Tesla with Autopilot is far safer than vehicles without it. The blog says Autopilot does not prevent all crashes but makes them less likely. In the report released Thursday, the NTSB said the SUV was operating with traffic-aware cruise control and autosteer lane-keeping assistance engaged at the time of the crash. The cruise control maintains a set distance between the cars and traffic in front of them. The SUV also was equipped with automatic emergency braking. According to the report, during the 60 seconds before the crash, Huang's hands were detected on the steering wheel three times for a total of 34 seconds. But for the last six seconds, hands were not detected on the steering wheel. Eight seconds before the crash, the SUV was following a vehicle and traveling about 65 mph. A second later, the SUV began a "left steering movement" while still following the other vehicle. Four seconds before the crash the Tesla wasn't following a vehicle any more. A second later it accelerated from 62 mph to 70.8 mph "with no pre-crash braking or evasive steering movement detected," the report said. When the SUV moved to the left, it entered a "gore area" that is marked with white lines and divides the freeway lanes from an exit ramp. Then it hit the barrier, which was equipped with an accordion-like device to absorb impact in a crash. But that device had been damaged in a previous crash on March 12. It likely will take more than a year to determine what caused the crash, NTSB spokesman Christopher O'Neil said Thursday. Among other factors, investigators are trying to determine how the car's camera, radar and ultrasonic sensors were working and what they were tracking. "The focus isn't Tesla's technology," he said. "The focus is on what led to this crash and how do we prevent it from happening again."